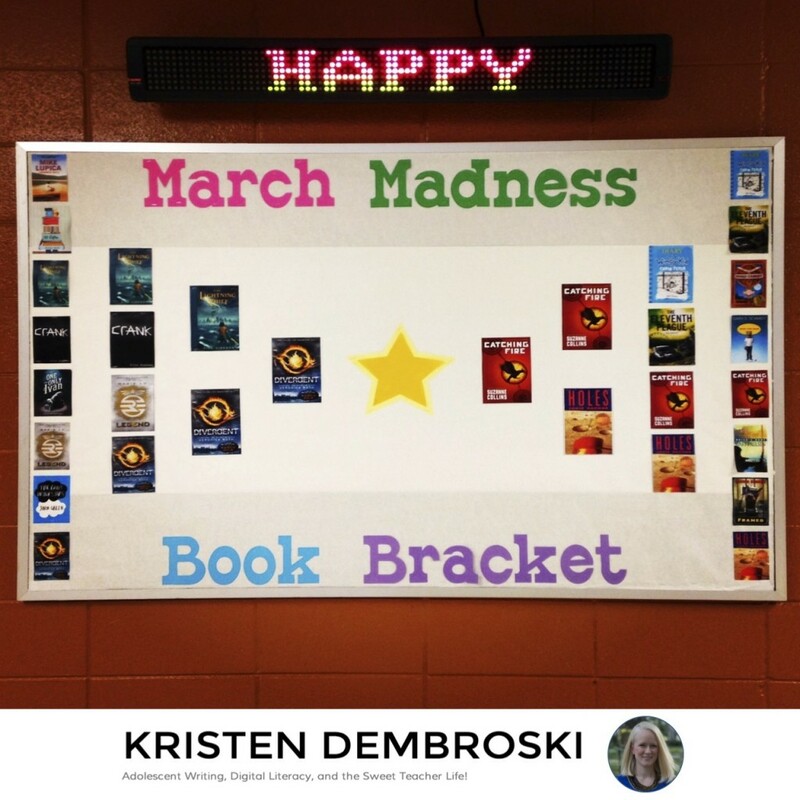 Hooray – I’m working on a fun new bulletin board in my classroom! This one is a take on Instagram, which is widely popular among my students. The board will feature pictures of my students engaging in fun reading and related activities all throughout the school. I’ll snap a few pictures during SSR (Sustained Silent Reading), Library checkout (that shining smile when they check out a new book!) and other candid moments in the classroom. I think my students will really enjoy seeing themselves on the board. Overall, my intent is to highlight the positive reading culture in our school. The hashtag at the top reads #wmsreads. This is for school use only – nothing will actually be posted on social media. I’ve slowly been working on this a bit every day for the past month, and they are just SO curious to know what it is about! I told them to wait and see, but the day I put up the Instagram logo? They couldn’t stop talking about it! 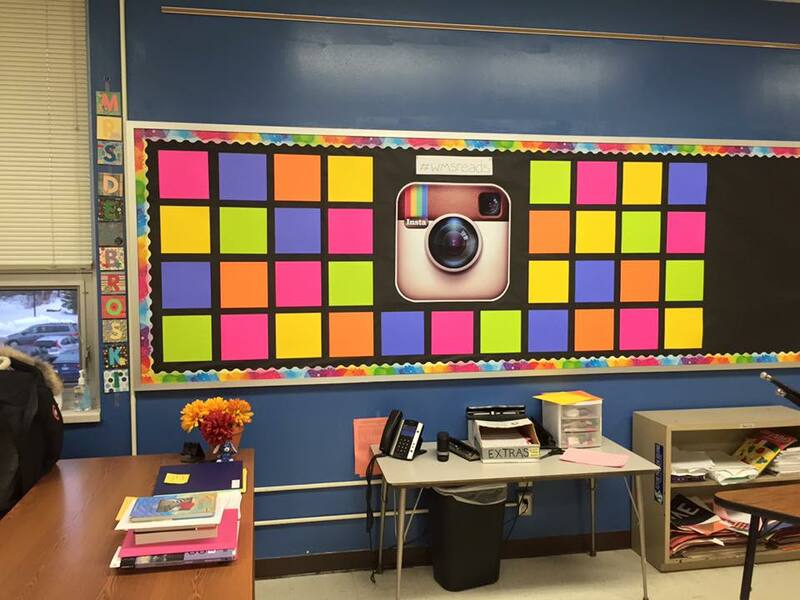 I can’t wait to see them checking the board each morning to see new pictures. Maybe they’ll be inspired to check out a new book, or ask a fellow student for a recommendation! UPDATE 5-15-16: See the final product by clicking here! This is my first year teaching 7th grade, and my first time teaching Literature Circles. A Literature Circle is when a small group of students read a shared book and discuss it as they go, as opposed to the entire class reading the same book in a novel unit. 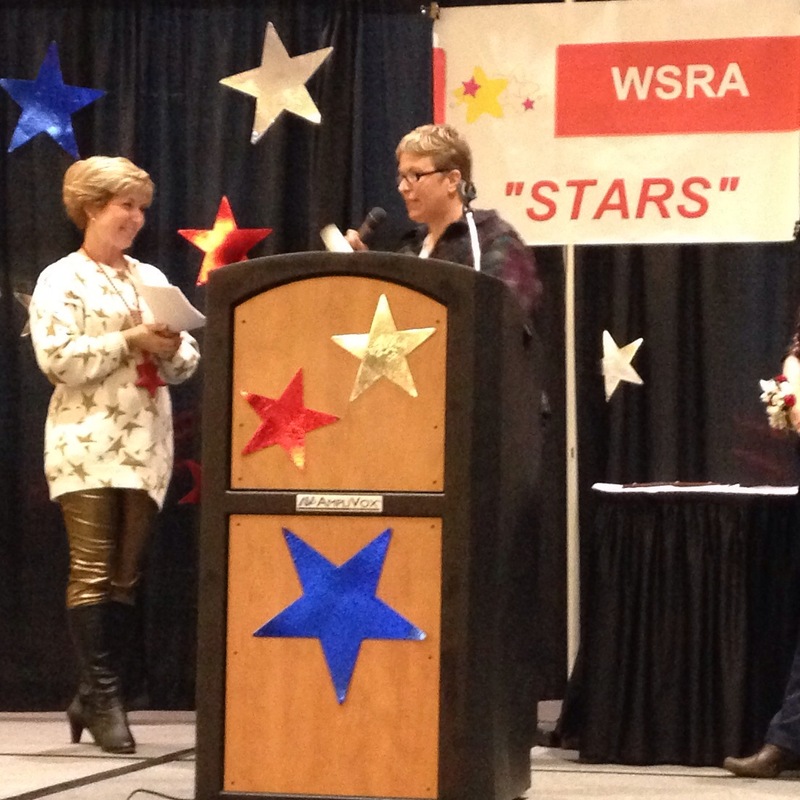 I thought I would share how it went, what we did, and what I would do differently next time. It’s a great experience for students, and definitely the perfect learning activity for cultivating a love of reading. It was a lot of work to set up the Literature Circles, but once we got them started, it was a breeze. I began by going through my cupboards and pulling out books that I had multiple copies of (at least 4 per class, and I teach 4 classes). On our Literature Circle kick-off day, I began by simply reading the titles of the books in order. Then I stopped talking. Yes, this is hard for teachers, but you gotta do it – just stop talking! Resist the urge to say everything you know about a book and divulge why you love it. It’s so much more fun to put them into the driver’s seat and let them explore the books that interest them. Otherwise they’d be sitting there listening to you blather on and on about a book they have zero interest in, just dying for you to get to the one they want to hear about. That really takes the fun out of it. I distributed the half sheets and explained that by the end of the hour, every student needs to rank his/her top 4 book choices. Next, I let them explore the books that interested them. I handed out copies of the books and encouraged students to read the backs and the first couple of pages to make sure the book would be a ‘right fit’ for them. I also pointed out which books were high or low Lexile levels, since that can be an important factor in selecting a novel. I know the students were looking at the number of pages, too, and that’s important as well. Why pick a really long book when you know you will struggle to finish it? I told my students that it’s important to have reasonable expectations and chose a book that you will both enjoy and be successful at. 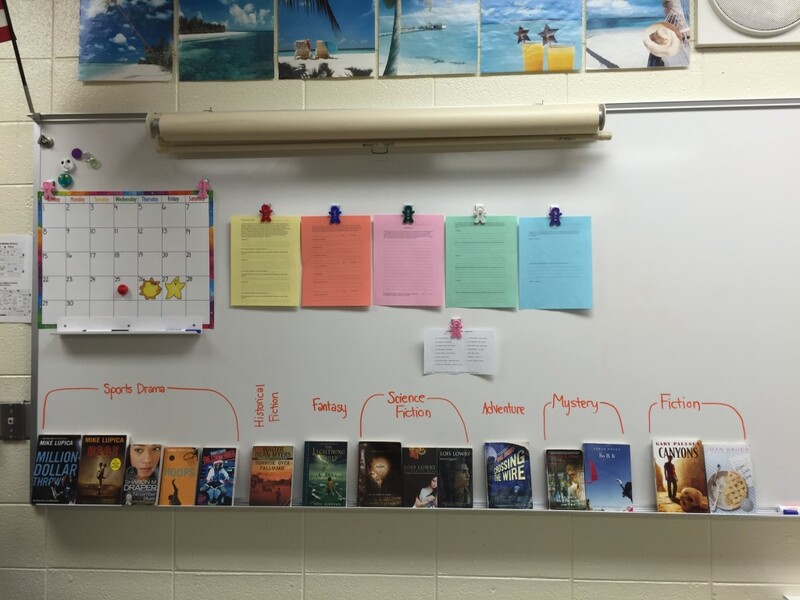 I gave students all hour to explore the novels and make their choices. At this point, I bet you’re nervous that students began scheming and selecting books that their friends wanted to read. I am happy to report that the scheming was at a minimum. 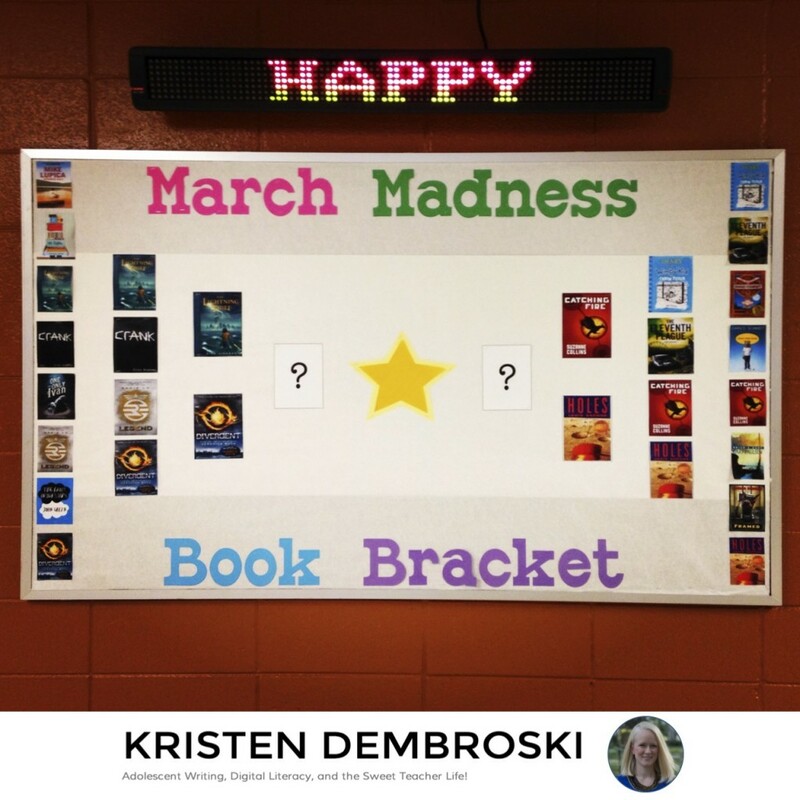 I made sure to emphasize that I can’t guarantee that every student will get his/her top pick, and that it is so very important to pick a book you will be successful with for the next month. After school comes the hard work. You have to lay out all of the half sheets and organize the students into groups. I aimed for groups of 3 – 5. I would say that about 1/3 of the students got their top pics, but every student got a book in his/her top 4. I also made some mindful decisions to separate particular personalities, a concern that all teachers bear in mind when making groups. On Day 2, I announced the Literature Circle groups. We rearranged the room so groups could sit together, and every group had to fill out a cover sheet for their group folder as shown above. The folders were kept in the room at all times (especially important for absences!). Then, I distributed the novels and explained the procedure for the next month. Over the course of 5 meetings, everyone must perform each of the 5 roles once. Before we even began reading, I had each group make a plan for how many chapters/pages they needed to read for each meeting, and who would perform which roles at each meeting. Even if a student is absent, he/she is still responsible for their reading and role – which they know well in advance. With all that hard work and planning out of the way, it was time to simply let the students read! They were responsible to themselves and each other for being prepared and staying on top of their obligations. Since they chose their own books, I believe they were much more interested and invested in this learning unit. Students wanted to read, and they were excited to talk about their books. I made a point of saying that I believe Literature Circles remind us why people love to read; they love to have someone with whom to share ideas and excitement about their reading. Every 3 school days (time for students to read), we held a Literature Circle Meeting. For the first one, I gave the students a challenge, because students love challenges! I put 8 minutes on my timer and explained that I wanted the groups to talk about their books and ONLY their books for the full 8 minutes, non-stop. I asked them if that sounded like a lot, too little, or just the right amount of time. They agreed it was a wimpy challenge, no problem! Next, we discussed how they would fill up the 8 minutes. I explained how each group member should explain his/her role and share the worksheet they completed. Then, group members should give him/her feedback on their roles. Sounds easy enough, right? Almost every group sped through and finished in less than 5 minutes. Not so wimpy of a challenge! I had prepared for this outcome, however. While students were discussing, I went around the room (checking for work completion) and placed a laminated discussion card or two at each table group. I purchased the discussion cards from Rachel Lynette here. They are a fantastic resource! Thanks to these cards, we kept the conversation going a bit longer. After our first meeting, I also took the opportunity to have a mini lesson on what makes a good discussion question. I had prepared a few questions ahead of time that typified clarifying and discussion questions, and we discussed the differences between the two. After Meeting #1, students felt confident that they would exceed expectations for Meeting #2. Before / After graphic: Meeting #1: As a class, we discussed how main characters are always dynamic, meaning they change in some important ways throughout the course of a novel. I used this graphic from Creatively Composing to help students work through how a main character in their novel changed. At our first Meeting, I only had them fill out the left side of the body, indicating a typical thing their character would think, say, feel, or do. We finished the graphic later, at Meeting #4. Symbolic Item: By Meeting #2, students had a pretty good grasp of what kind of person their main character is. I had them select a symbolic item (one that could fit in a paper bag) to represent their character’s personality. The hitch? It could NOT be an item from the book – they had to think outside of the box. We got some pretty creative, abstract, and interesting ideas for this one! Book Trailer: At Meeting #3, I had students look up a book trailer for their novel on Youtube. I had them watch and critique it to the class, sharing what they liked, what they thought the author got right, and what they would have changed about the trailer if they had made it. Before/After graphic: At Meeting #4, I had students complete the right side of their Before/After graphic, indicating how their character has changed. Then, we shared as a class. 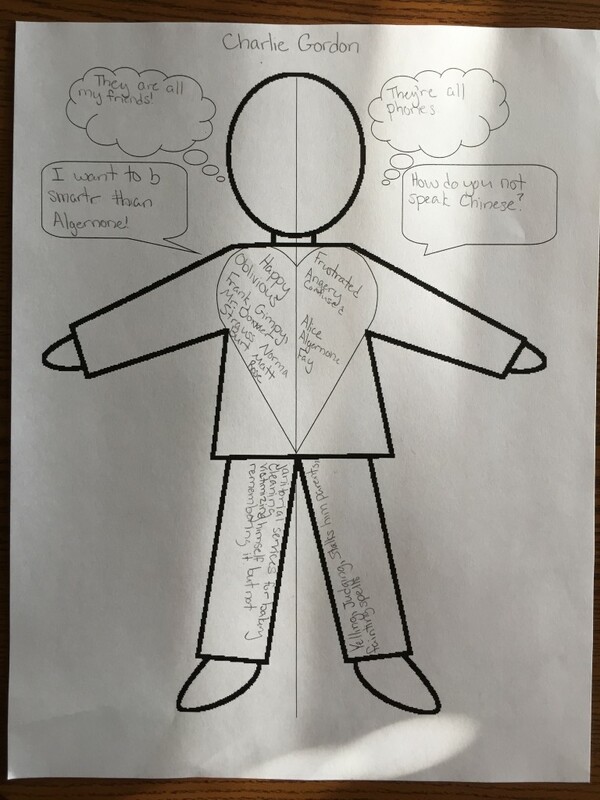 Students noted a theme – most of the characters changed in their feelings or thoughts, not always their speech or actions. Rebrand Your Book: At Meeting #5, the end of the novel, I told students that they were being ‘hired’ by a publishing company to rebrand their book to increase sales. They needed to give it a new title and cover art. They presented to the class and defended their choices. In addition to the 5 Meetings and these 5 Extension activities, we also had Library Tuesday and Informational Text Wednesday, just to add variety to our weeks. What would I do differently next year? Change up the novel selection – As it turns out, I would probably remove Sunrise Over Fallujah for 7th graders. I’d also like to add more fantasy and historical fiction options. Less Busy Work – Reading is supposed to be fun. The group roles / worksheets? Not fun. I know I need a way to keep tabs on students and make sure they are keeping up with their reading, but maybe I could streamline this a little bit (or a lot). I don’t want to ruin the experience with banal, meaningless work. Modeling – I’d like to do a performance Literature Circle for students, maybe a couple of teachers modeling the do’s and don’ts of how to run a Meeting? Seating Charts – I have assigned seating in my room, and I normally change up the seats every 2 weeks. I do this to help students learn to interact with each other and to discover new ideas. For this month, I grouped students by their novels, and they sat together the entire time. I wish I hadn’t done this. 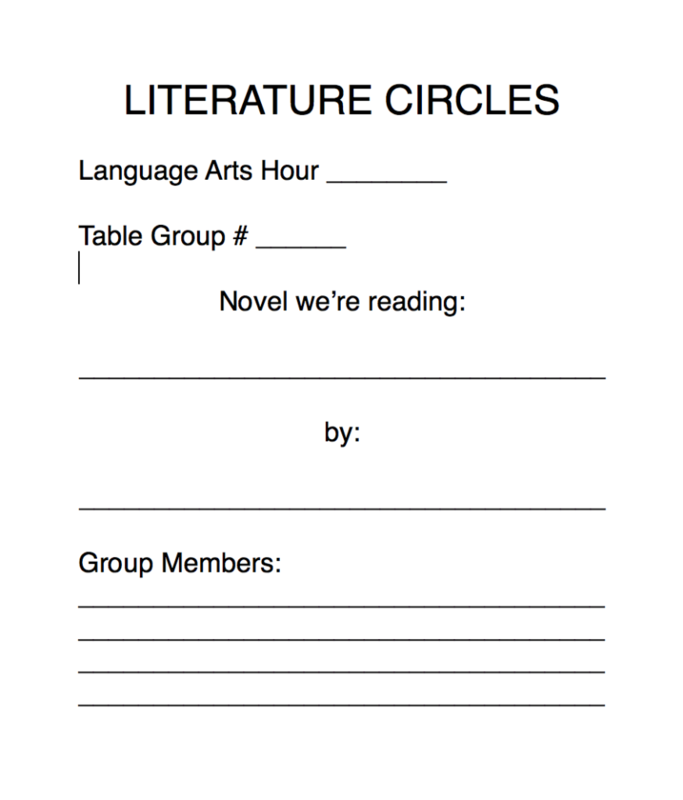 I wish that the only times that students sat with their Literature Circle groups were for actual meetings. This way, they could be learning about other books throughout the month, and they could save their thoughts about their own books just for the Meetings. Book Pitch – At the end of the month, I’d like students to try to pitch their book to other students in the class. Who better to get you excited to read a new book than a fellow student? What did I get just right? Timing – I’m glad I gave them as much time as I did to read in class (3 class days between meetings). I know this is a bit pessimistic to say, but I worry that without giving them in-class time, many books would not get read. Informational Text – I’m very glad we continued to spend one day a week working on informational text. No one likes to do the same thing all day every day for a month straight! We also got to keep up on our other reading skills. Discussion Time Challenge – At each meeting, I gave them a time challenge, and I increased my expectations by one minute each time. The first meeting was 8 minutes, and the last was 12. I put a timer on the board so students could monitor themselves. 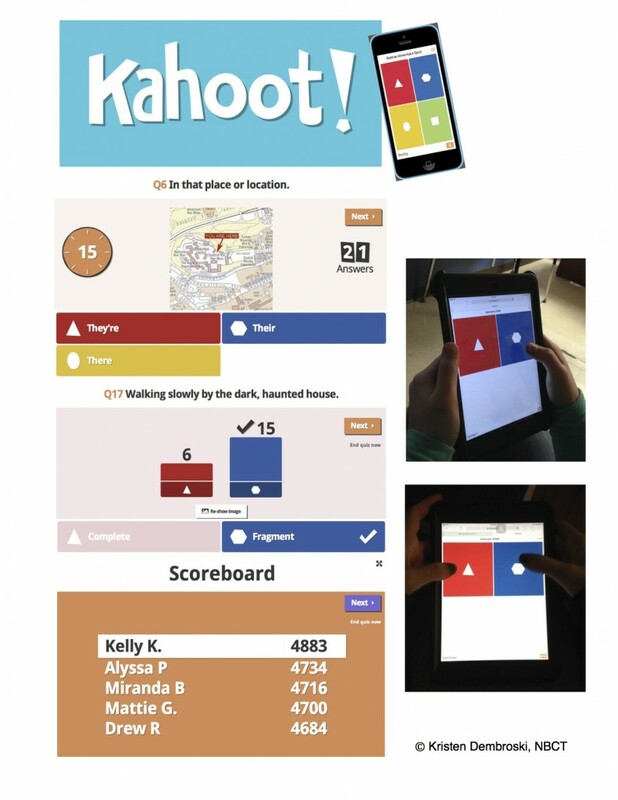 I think this was an important, appropriate challenge for middle schoolers to monitor each other and stay on task for an extended period of time. 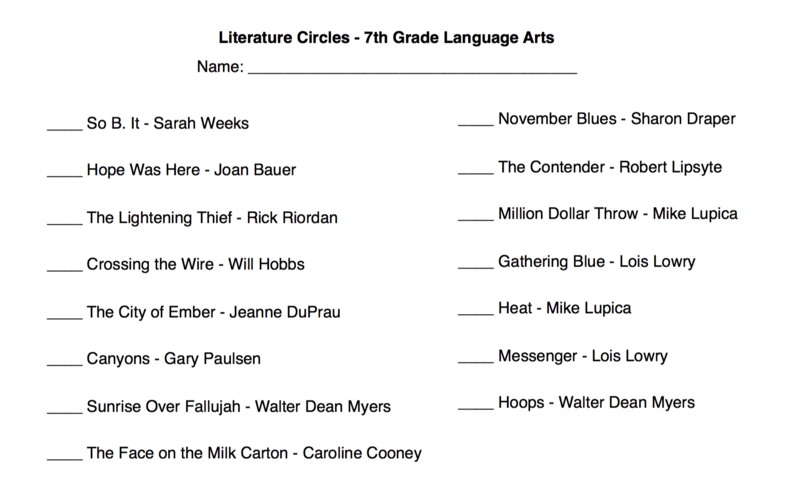 So there you have it – my first attempt at Lit Circles. I’d love your feedback! Please comment below on what you’ve done in the past, or any other suggestions you might have for making Lit Circles a success! I had a great time this week teaching a Children and Adolescent Literacy Course to graduate students in the Reading Program at Viterbo University. I met so many awesome, motivated, passionate, and knowledgeable teachers. I know I learned as much from them as they learned from me – what a win-win! We started each day by reading a children’s book and discussing how we might use this in our own classrooms. We looked for concepts, language, intertextual connections, and how to use the literature to encourage joy and a love of reading. As a class, we also read “Readicide” by Kelly Gallagher and “Book Whisperer” by Donalyn Miller as our textbooks. We had many discussions about the challenges we face in education today, and what we can do now to start a grass roots movement to begin a positive change. Each day, every teacher took a turn sharing a favorite literacy resource. This was maybe the most powerful and informative thing we did all week. If you put a group of passionate, driven teachers together in a room and ask them to share their favorite resources, you are going to walk away with an amazing list of classroom-tested ideas to try. I have so many cool new tools to try in the fall! Other topics we discussed this week included Independent reading, close reading, incorporating reading and writing, using technology effectively, multimedia, vocabulary, and encouraging a school wide reading culture. We put all of our resources and ideas on a wiki so that we could reference them throughout the year. For their final project, my students had to create a literacy unit that they could use in their own classrooms next year. It had to include an anchor text, intertextual connections to another expository text, multimedia, vocabulary, close reading, prior knowledge, and text analysis. They made some really great units that they should be so very proud of! It was an exhausting week, but in a really great way. 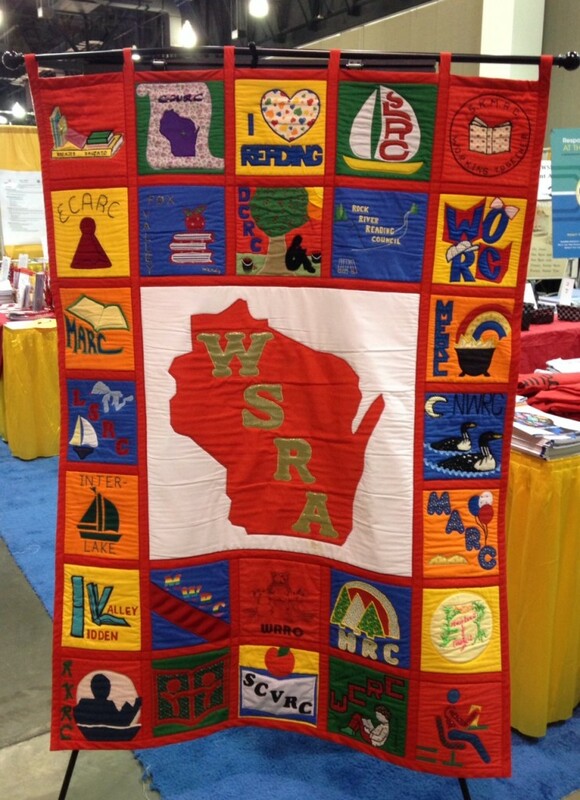 I met so many wonderful people and I’m so very reinvigorating for teaching reading in the fall. I can’t wait to teach this course again! We had our final vote on Friday, and we elected our own school-wide book champion: Divergent! 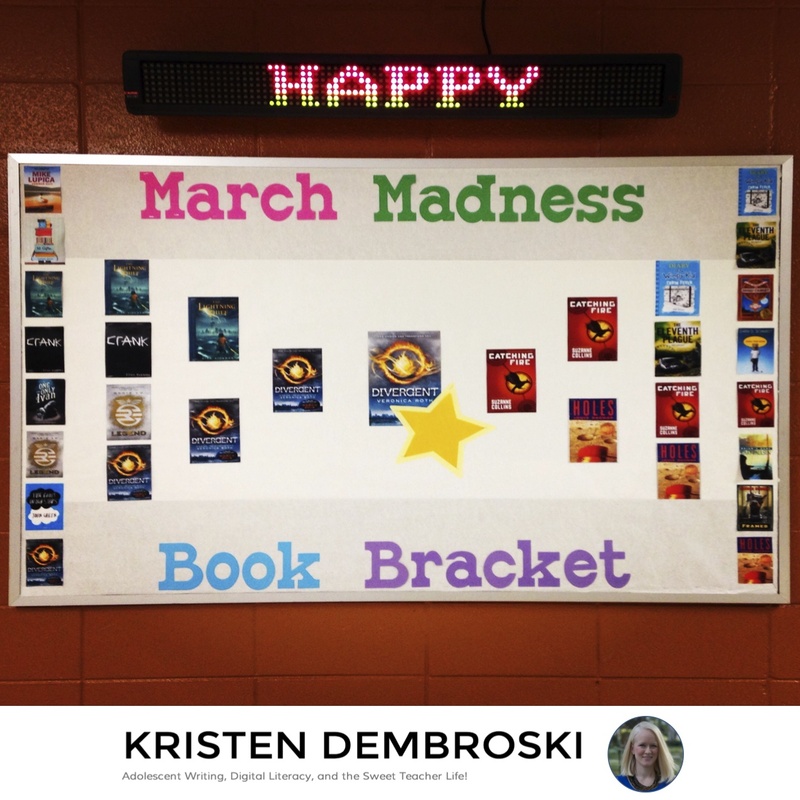 Our March Madness Book Bracket has been a very fun adventure. 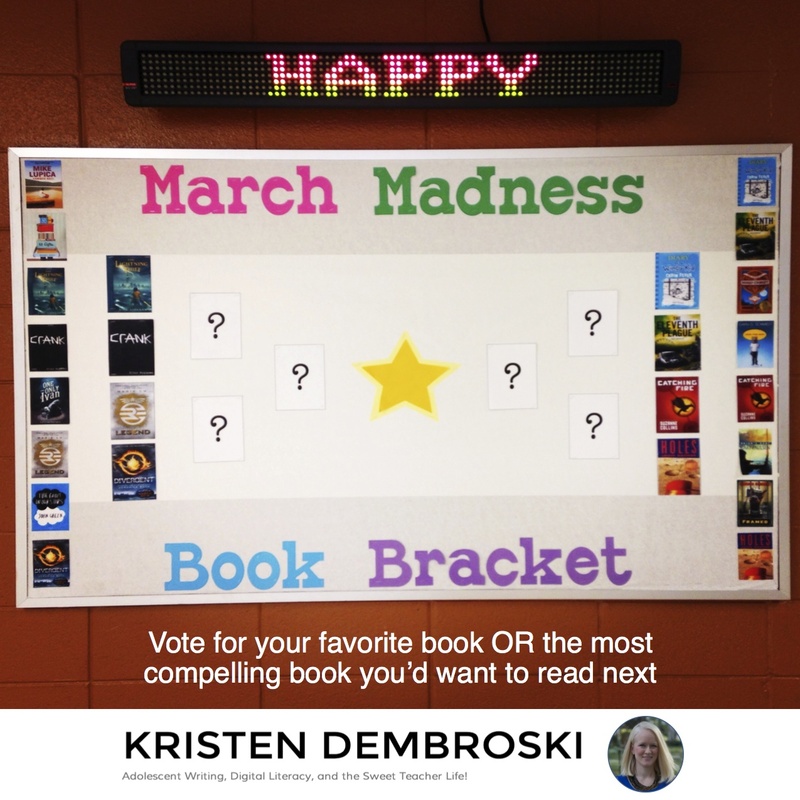 I have decided on my favorite outcome of this book bracket. I love that we could celebrate our reading culture at our middle school. 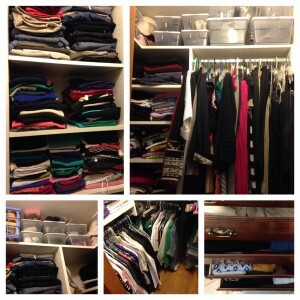 Some ‘closet readers’ finally felt like they have a voice and that it is okay (and even fun!) to talk about books. Suddenly, the well-read students are the heroes in the classroom because they have the knowledge and opinions to contribute. I’ve just loved the past few weeks! I hope you can use this bracket to help compile your summer reading list! For a full list of the 16 most popular books at our school, click here to read the original post. Well I am VERY excited to share a new school wide reading project with you. 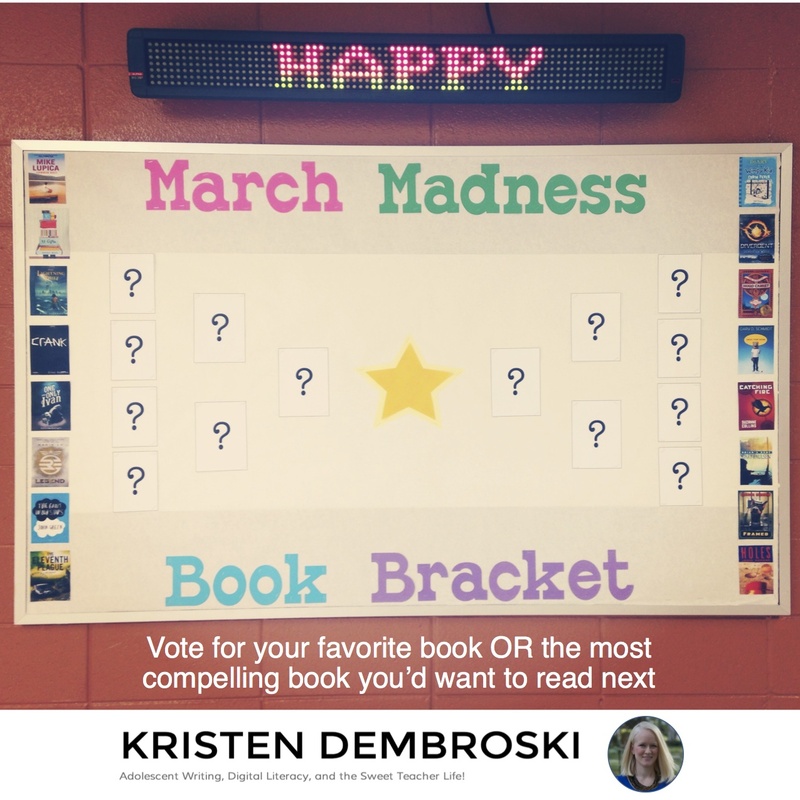 I created a March Madness Book Bracket for our middle school (grades 6-8). I figured – hey, the kids are really excited about their NCAA brackets. Why not capitalize on their excitement and direct some energy toward books and reading? Of course! 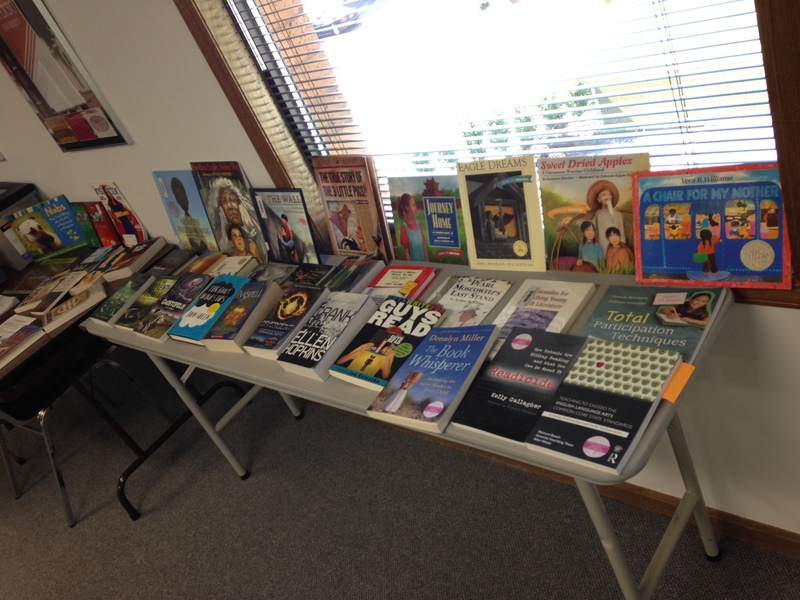 I then created a presentation to share with all of the Language Arts teachers that includes a picture and a brief synopsis of each book. Students will vote in Language Arts class, and we will use an electronic survey (Google forms). They are asked to vote for either a) their favorite books or b) the most compelling books they would want to read. We will continue until we have one winner for our whole school. I think this activity is going to generate a lot of interest in these books. I’ve asked the librarian to please use up any remaining budget to purchase a few more copies of this. I can’t wait to report back on the wonderful developments! It’s been a while since I’ve given an update on my reading intervention crew. I work with a group of seven 8th graders on a weekly basis who can benefit from an extra reading boost. We first began with Newsela, which is such a wonderful FREE tool. I’ve been able to track their progress and meet with them to discuss strategies. We read one article and completed the quiz together so that my students could see just how much effort it is to find the correct answer. You have to a) read carefully b) monitor your own comprehension, then c) make sure you understand the question d) [and this is SO important] actually go BACK into the text to find the answer e) use process of elimination to check your answer (make sure the others don’t make sense). 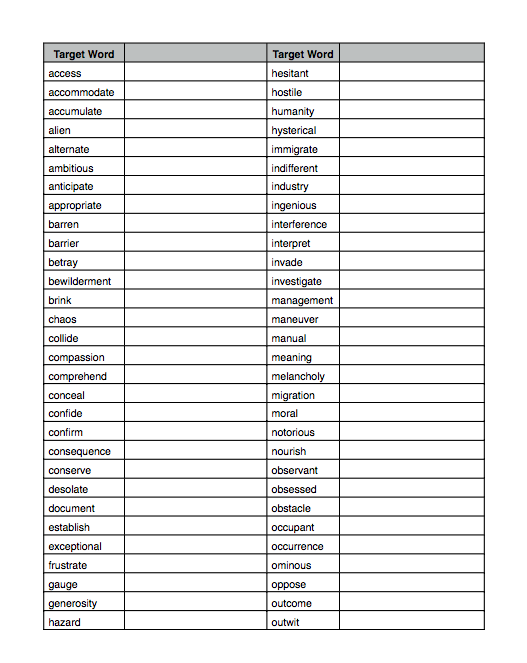 Now, we’ve also added a vocabulary element to our sessions. I started by locating a list of the Top 100 6th grade ‘need to know’ words. Since my 8th graders are each about 2 years behind in reading abilities, this seemed an appropriate place to start. First, I had them simply read the words out loud to me. 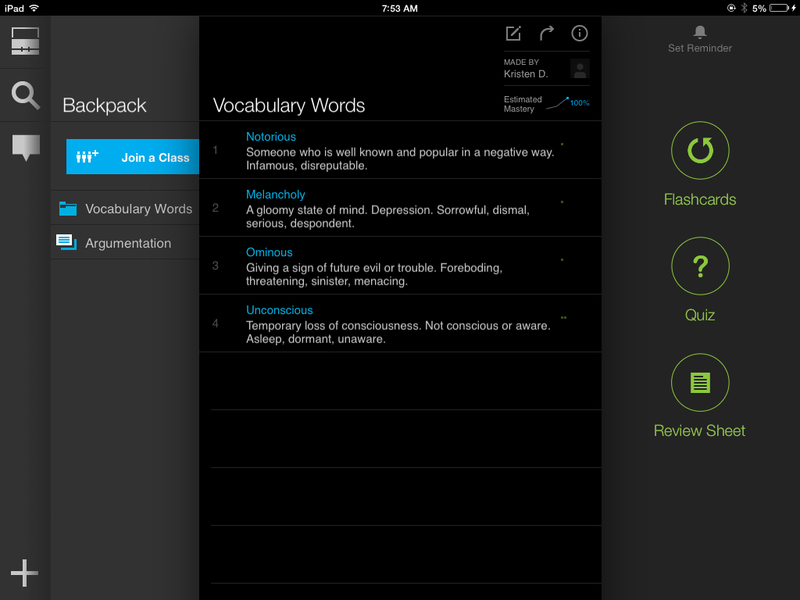 I marked any they miscued – those would certainly become vocabulary flash cards. Later, I also had them go through the list again and prioritize a list of an additional 10 words they want to learn about. 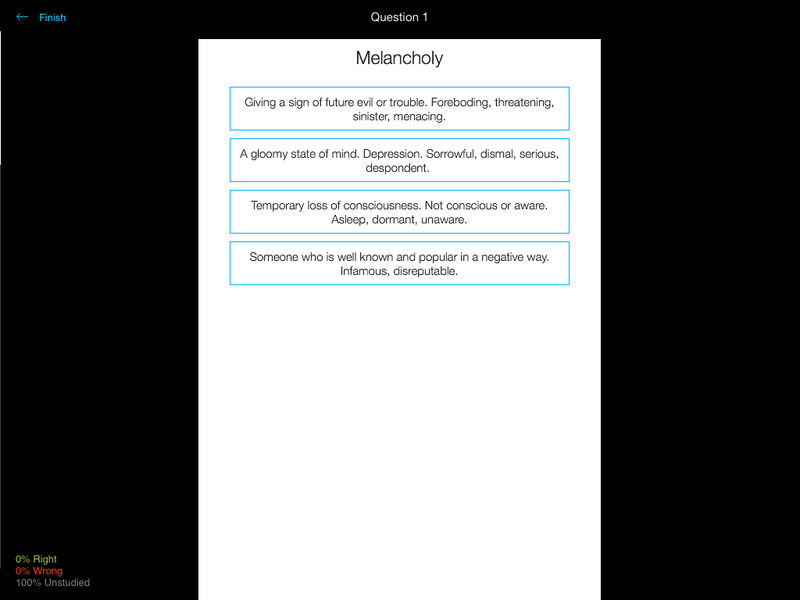 As it turns out, each of my students had 4 miscues in common: notorious, ominous, melancholy, and unconscious. These 4 words would become our ‘group words’ that we would all study together. 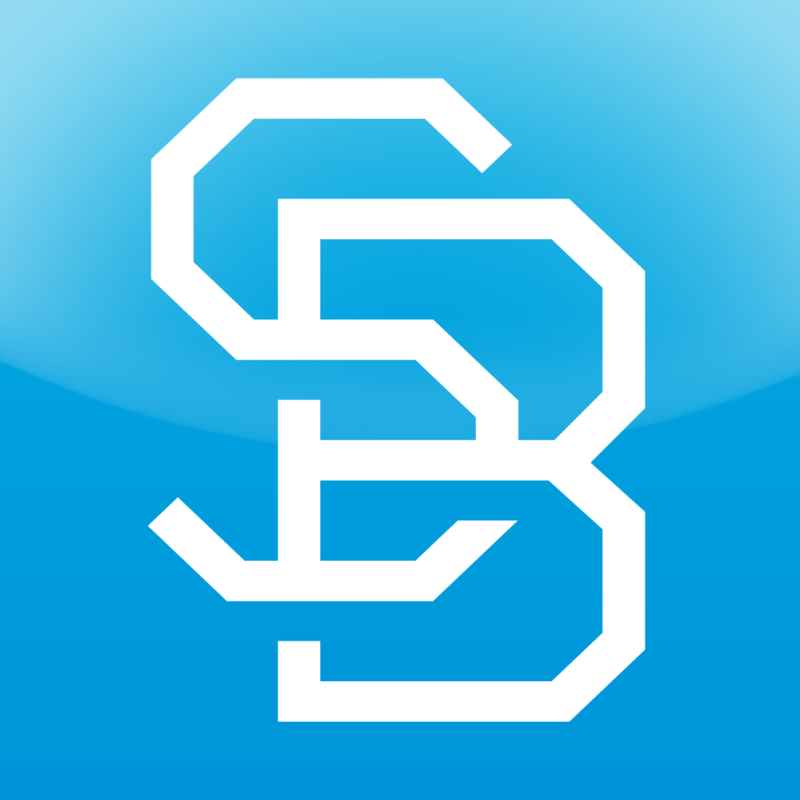 Beyond that, their lists became personalized based on individual needs. I had my group all download the app StudyBlue, a free app for creating flashcards, review, and quizzes. Next, the students had time to use the Flash Card feature on the right. 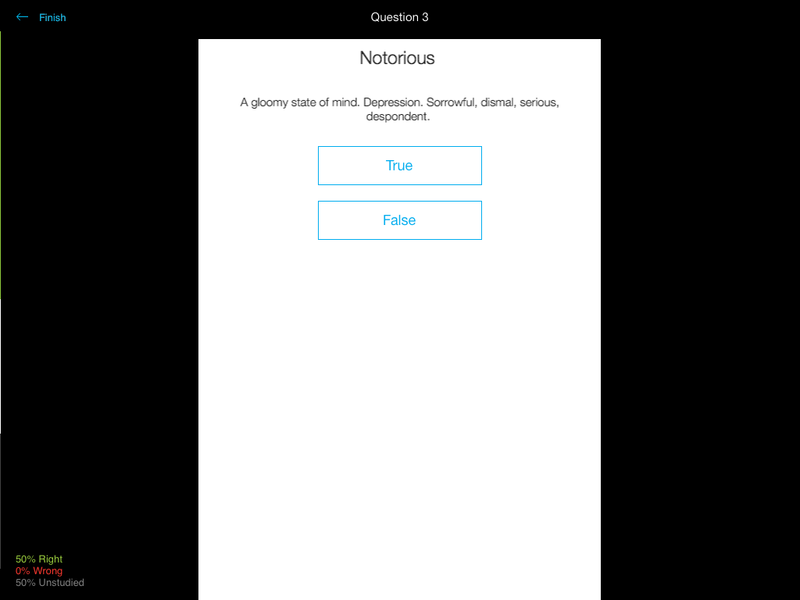 The app gives you a choice of either term or definition. You tell the app if you recalled the term correctly or not, and the app tracks your progress. Obviously this will become more challenging as we add more words to our set. 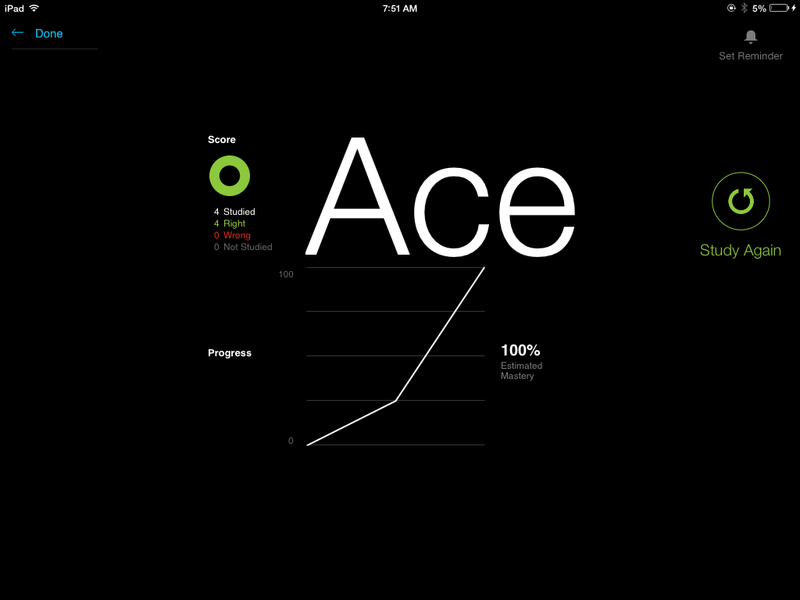 I love that this app tracks your progress as well. Once the students master the 6th grade words, we will move on to 7th grade words. 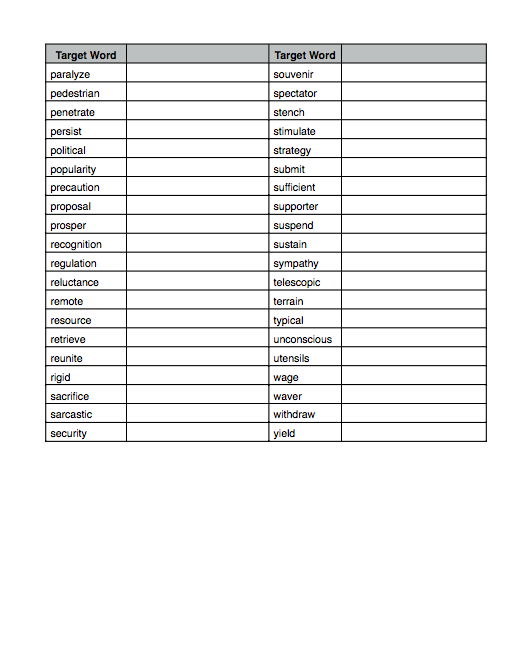 We will also continue with Newsela, and I have plans to do some word study as well (such as this Word Tower Greek and Latin roots/prefixes/suffixes activity). Things seem to be going very well with my group. This is due in large part to the fact that they are great kids and all very motivated to improve. It also doesn’t hurt that I maaaaaaybe bribe them with candy. Hey – it’s a teacher’s best kept secret! I will continue to monitor their progress and find new ways to challenge them and help them boost their confidence and soar in the classroom! RL.8.3 Key Ideas and Details: Analyze how particular lines of dialogue or incidents in a story or drama propel the action, reveal aspects of a character, or provoke a decision. RL.8.5 Craft and Structure: Compare and contrast the structure of two or more texts and analyze how the differing structure of each text contributes to its meaning and style. 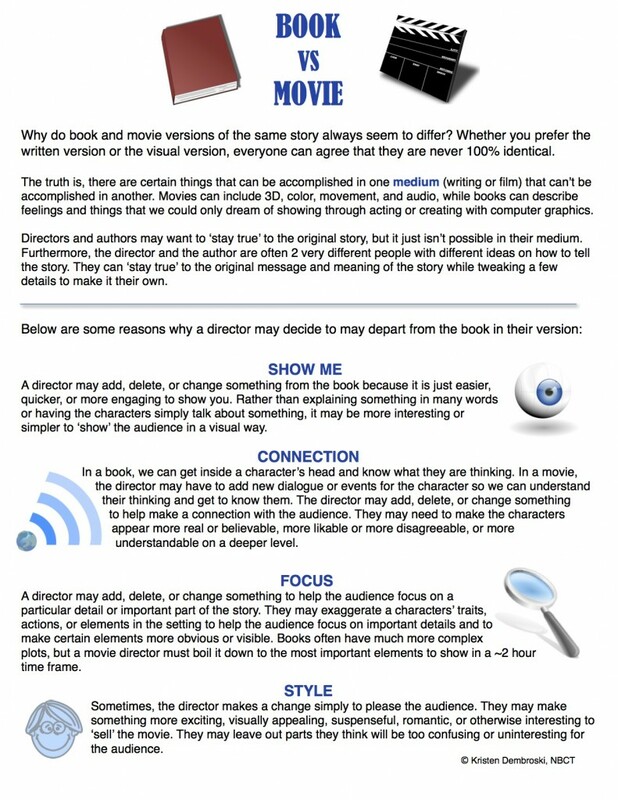 RL.8.7 Integration of Knowledge and Ideas: Analyze the extent to which a filmed or live production of a story or drama stays faithful to or departs from the text or script, evaluating the choices made by the director or actors. 1. Identify one significant way in which the director ‘stayed true’ to King’s version. 2. Explain why you think the director chose to ‘stay true’ to the short story for this. 3. Identify one significant way in which the director departed from King’s version. 4. Explain why you think the director chose to depart from the short story for this. If you would like to download the picture above as a FREE PDF, click here. Do you do a book / movie comparison unit? I’d love to hear how you tackle this! High Five For Friday! 1-31-14! Wow, the last day of January AND the last day of week 21! Here are the highlights as we say hello to February! 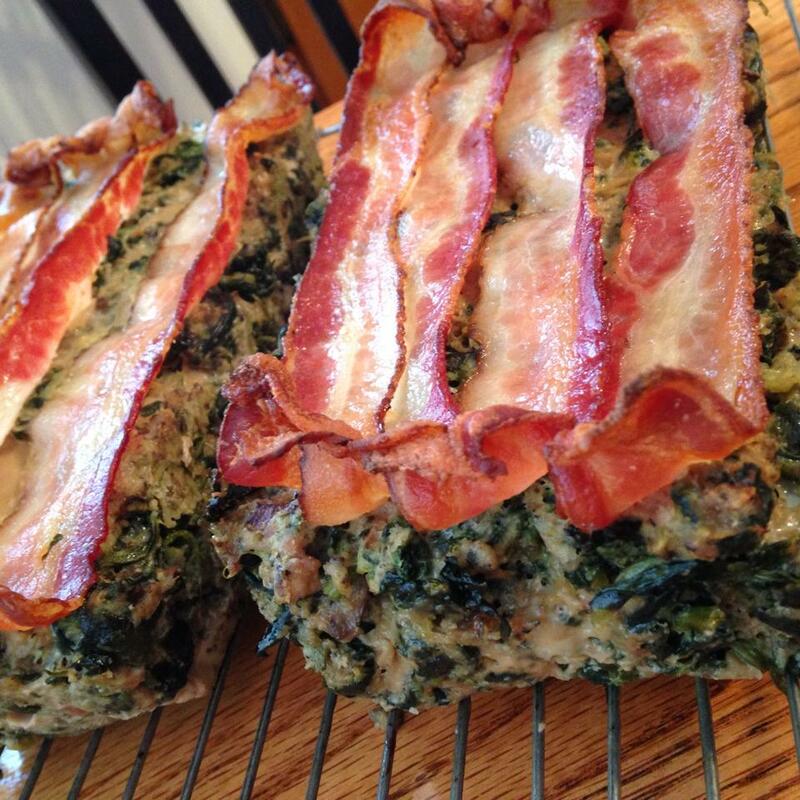 Food Drive, Review Quotes, Spreading Sunshine, Polar Vortex Closet Cleanout, Paleo Bread and Meatloaf. Plus a Bonus of Rocket & Ruffy! 1. 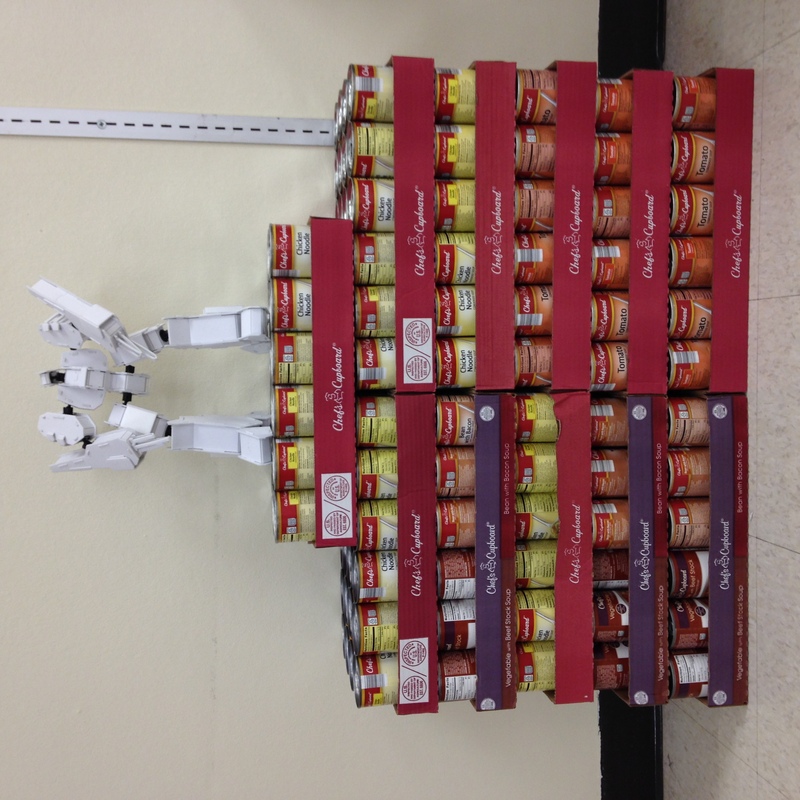 Food Drive – Okay the BIG news this week is that it is our annual Middle School Food Drive for Hunger Task Force. Every year, we have a homeroom competition for 1 week to see who can bring in the most food. Each day, there is a special item worth double points (pasta, peanut butter, juice / water, canned fruits / vegetables), and on Friday, the special item is canned soup, worth 5 points. Lemme tell ya, the competition is palpable. Teachers and students alike are strategizing and scheming to win the coveted SOUPerbowl trophy on Friday. In fact, I can’t even tell you who won yet because I’m waiting with bated breath to find out! It is so touching to see how much the students really care about this project – I know it hits home for so many of them. Going without food is something you would never wish on another human being. This is especially poignant this time of year when cold weather and rising costs of electricity compound the problem for many families. So my students all happily participate in this project, and many get creative to raise funds and/or collect food. In my homeroom, I ask that even if we don’t win, we must have 100% participation. Everyone donates at least 1 can of food or some change so I can go out and buy food. Well so far my students have donated over $165! 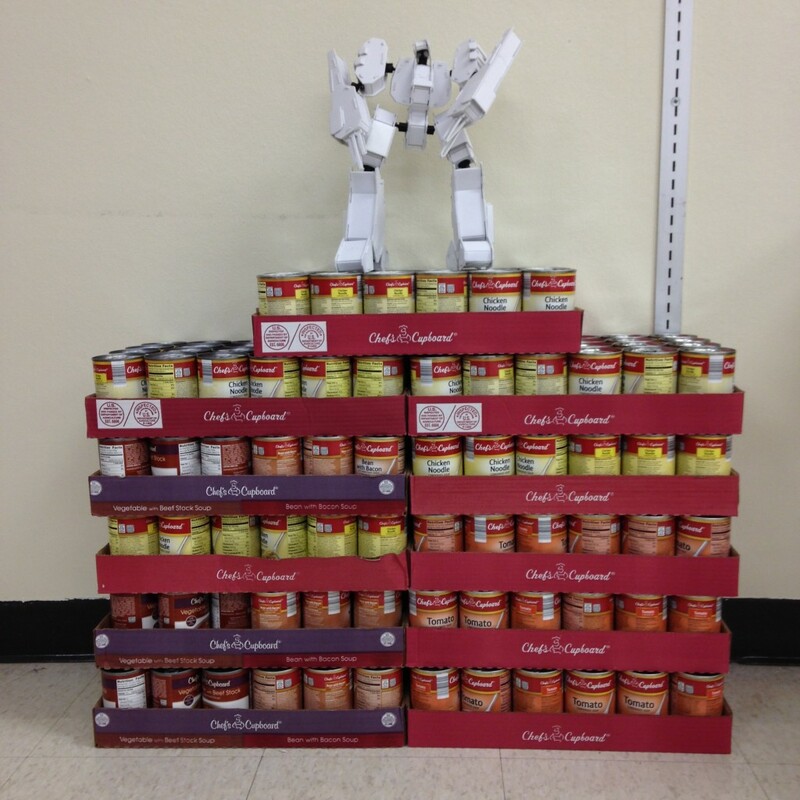 I took the money to Aldi to purchase soup for SOUPerbowl Friday, and that’s what you see above. $165 worth of soup! I sure do hope my kiddos win, but even if they don’t, they win a valuable lesson about empathy, values, and the joy of giving. 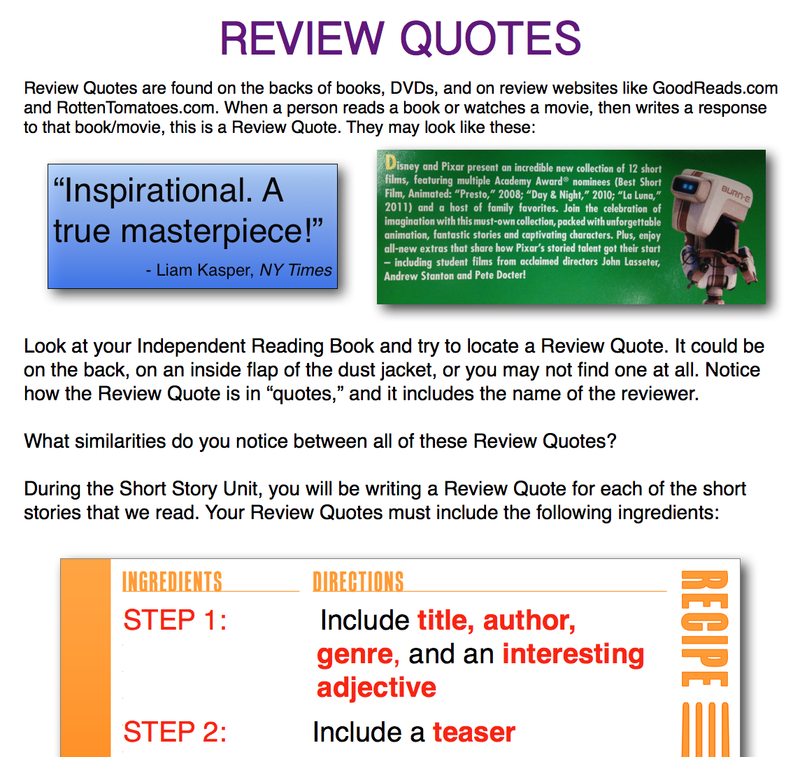 2. Review Quotes – We have begun our short story unit for Quarter 3. 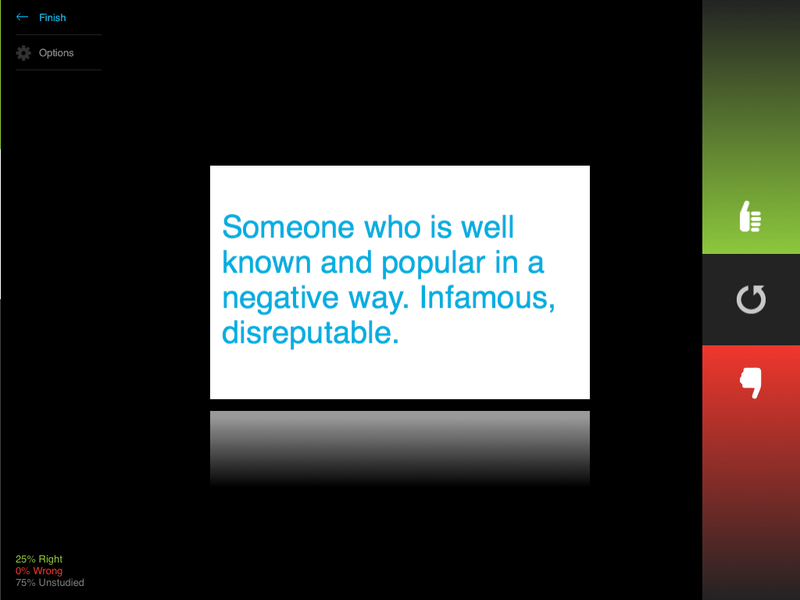 After each short story, I have my students write a “Review Quote.” They wind up writing about 10 of these, and they get very good at them through the process. It is a combination of creative and expository writing. They must be very selective about their word choice as they attempt to ‘sell’ the book, but they must also cover all the material required in a thorough review / critique. The image above is just a teaser of this mini unit, which I am working on getting up on TPT soon. It is currently 9 pages of ideas and instructions that the students find very helpful to guide them through the process. I get excited to see how much they grow through this unit! They carefully pick and choose their words, deliberating every detail. It’s a fun unit! 3. Spreading Sunshine – I had so much fun this week spreading ‘sunshine.’ Florida sunshine, that is! 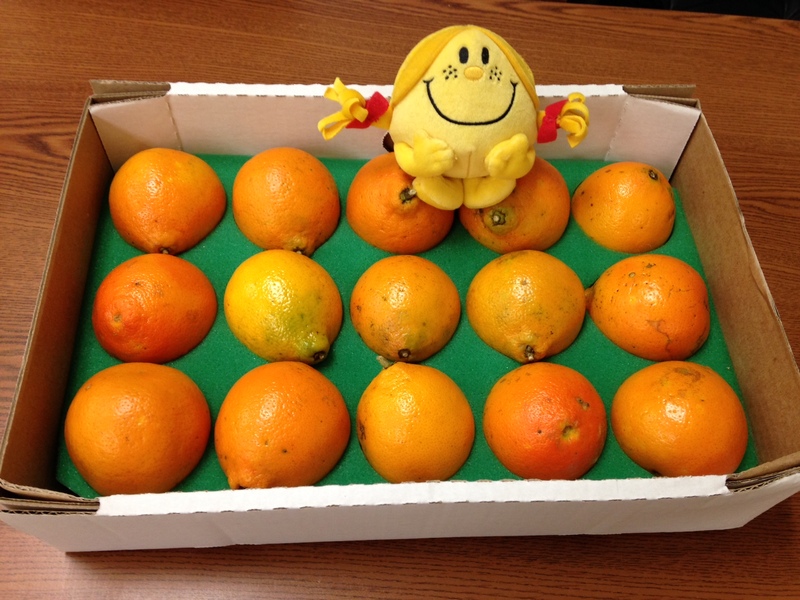 This is a crate of oranges imported directly from Florida. Before school, I went from classroom to classroom delivering oranges to our hardworking, deserving, and oh-so-exhausted teachers. I hope it made them smile! 4. 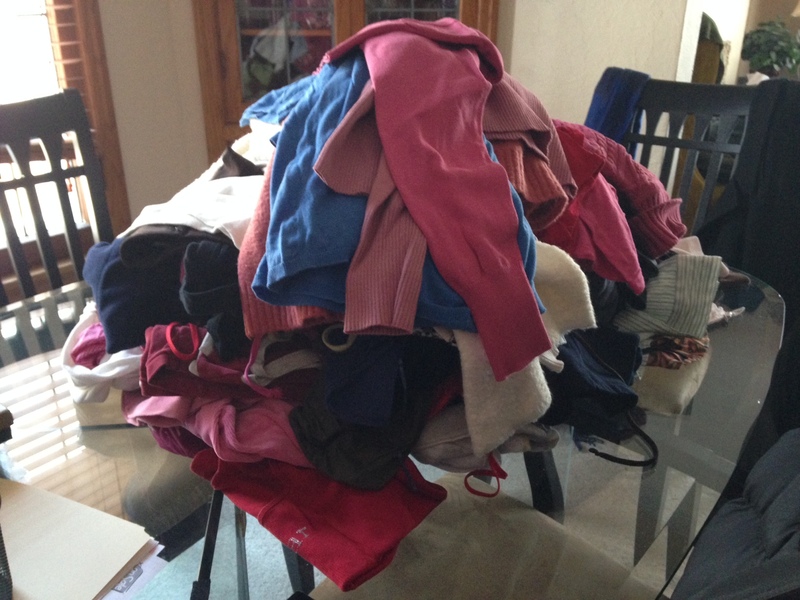 Polar Vortex Project – We had 2 Cold Days this week, which meant I didn’t leave my home (or my pajamas!) on Monday or Tuesday. I got a little bit of cabin fever. What? I just don’t sit still well. Most teachers don’t – we like to keep moving. So I kept busy by cleaning out my entire closet and dresser. Now, it’s an organized masterpiece! 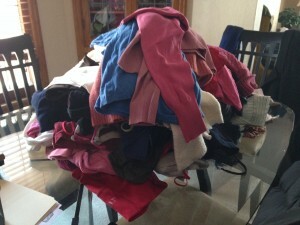 The second picture is a pile of clothes I donated. Most of them went to my students who asked for or needed warm sweaters and other clothing. So I got a jump start on my Spring Cleaning! 5. 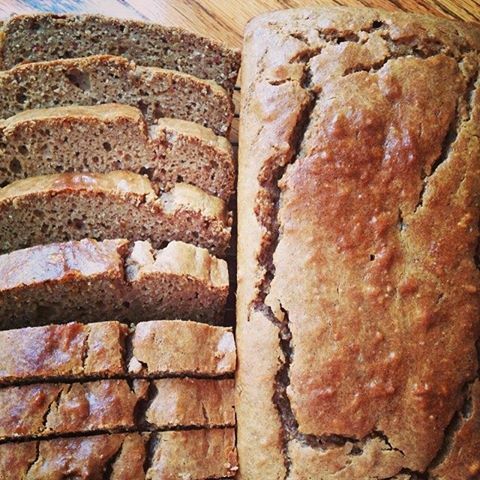 Mmmmm – Another way I kept busy during the Polar Vortex Cold Days was baking and cooking! 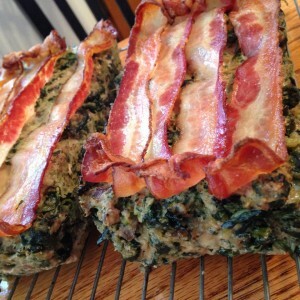 I made Against All Grain’s Paleo Bread and Nom Nom Paleo’s Super Porktastic Bacon-Topped Spinach Meatloaf. Y’all, these things CHANGED. MY. LIFE. Seriously. I can eat ‘bread’ again! It was so great to smear it with almond butter! And the meatloaf? I’m never NOT topping meatloaf with bacon ever again. Adding the spinach made the meatloaf so juicy and delicious. These women are geniuses, and I hope they make millions off of their cookbooks. 6. 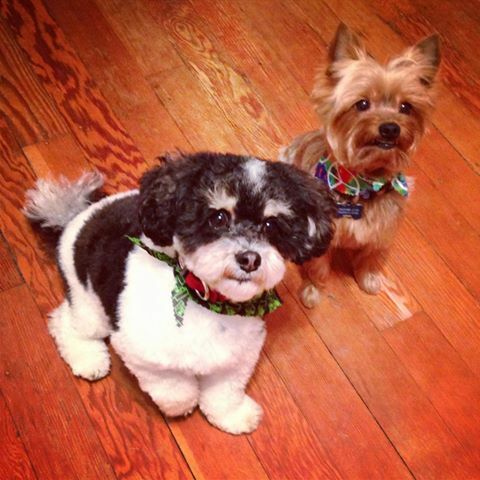 The boys got their hairs cut. They are so cute. I just love them so!